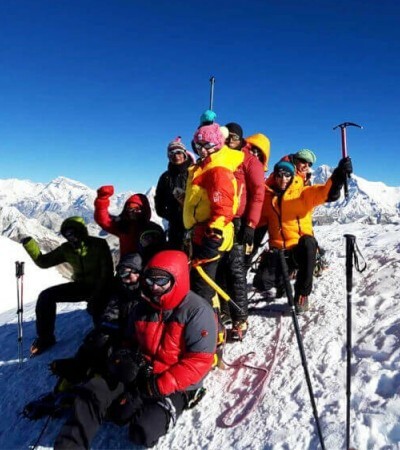 Pisang Peak Climbing is the most popular and wonderful climbing trip in the Annapurna region of Nepal. The trip adjoins the world renowned Annapurna Circuit Trekking, which is the trekking that crosses the highest Himalayan pass of the world, has made the trip more exciting and fabulous. Pisang Peak (6091m) is situated over the Pisang village, surrounded by the glacial range. After the German Expedition Team ascent Pisang peak for the first time in 1955 AD, the popularity has been increased. The views of the Annapurna Himalayas, Tilicho Peak, Ghangapurna, and the surrounding peaks are spectacular during the trip. It is advantageous both for trekking and the peak climbing. The Pisang Peak Climbing begins with a drive to Khudi from Kathmandu and continues the trek to Pisang village. The subtropical forest, rice and paddy farm on the way to trekking trail are beautiful. Besides, the scenic beauty of surrounding Himalayan ranges including the Annapurna and Pisang Peak, the beautiful waterfalls and the suspension bridges are the further features of this trekking. Similarly, the yak pasture land above the Pisang village is a base camp site at 4573m. From the high camp at 5030 meters, the final summit is made. After reach on top of the Peak, the visitors may enroll in the heavenly beautiful sceneries of surrounding mountains and descends to the base camp. Although it is a pretty easy trip, the icy slope and glacial range make it adventurous and it cannot be denied. From Pisang village, the climbing group joins the trekking and cross the Thorung Pass via Manang and Phedi. Connecting to the sacred place of Muktinath and the Mustangs Headquarter Jomsom, finally, you have a short flight to the beautiful valley, Pokhara which is situated on the Fewa Lake and end the trip. The Rising Adventure leads you to the stunning Pisang Peak Climbing and the classic Annapurna Circuit Trek with our professional guide and the team. We are aware of the high altitude sickness and acclimatization along with branded peak climbing equipments. Day 17 :Trek to Kagbeni (2810m/ 9219ft), 5-6 hrs walk.